(NaturalNews) One of the most extraordinary stories in the history of American journalism took place this last week, and the mainstream (liberal) media was AWOL the entire time. An historical showdown between heavily armed federal agents (BLM) and armed American citizens unfolded near Bunkerville, Nevada, where the Bundy family announced they were taking a stand against a federal land grab and cattle theft operation masterminded by federal agents working at the BLM. The showdown ended in a complete victory for Citizens vs. government tyranny as the feds effectively surrendered, announced their evacuation and agreed to release all the cattle they had stolen. See the photo below for a snapshot of the history the mainstream media stupidly decided to ignore. What's so astonishing about all this is that the mainstream media seems to have dispatched zero reporters to the scene and went to great lengths to downplay the reality of the situation as it unfolded. In doing this, the media lost massive credibility with the U.S. public, because it's now clear there was a directive -- almost certainly from the White House -- that commanded media organizations to ignore the story or spin it with outright lies. Meanwhile, alternative media -- citizen journalists -- made history by broadcasting live video from the Bundy ranch, posting video updates every few hours and conducting groundbreaking original research that uncovered the real story behind BLM's cover story that they were "saving tortoises." What's really clear in all this is that the mainstream media just embarrassed itself beyond belief while simultaneously losing huge numbers of viewers. CNN was covering some guy's international food adventures while independent media people like Pete Santilli (GuerillaMediaNetwork.com) were on the scene at the Bundy Ranch and broadcasting live reports to the world. Video news organizations like Next News Network with Gary Franchi were pounding YouTube with video update and exclusive interviews with people on the scene. Click here for a complete playlist of all the videos Gary posted over the last several days. Matt Drudge of DrudgeReport.com was headlining key developments in the story, driving enormous traffic to alternative media sources that dared to report the truth of what was unfolding. Adam Kokesh from Adam Vs. the Man was booking guests, slamming home remarkable interviews and getting massive eyeballs on YouTube for his outstanding work. See his YouTube channel here. Organizations like Natural News and InfoWars were conducting original research and posting factual stories that went super-viral, clocking in 20K or more Facebook shares in mere hours. One story by Infowars reporter Kit Daniels became the most viral news story of the day, surpassing every mainstream news organization on the planet. In fact, it was alternative media -- with the relentless help of grassroots liberty lovers who tweeted, posted and shared the stories and videos -- that drove this story into the consciousness of the American people. 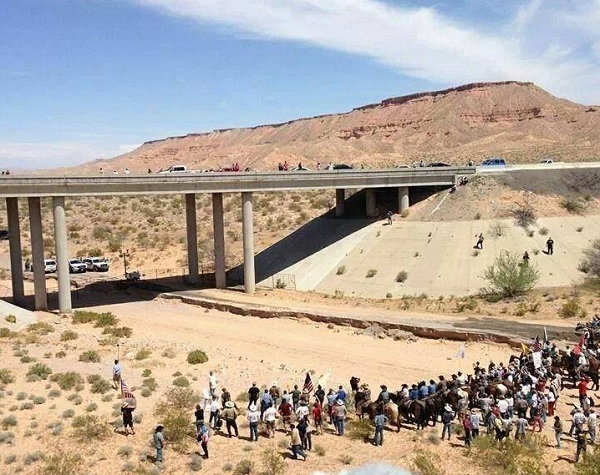 This is what ultimately led to BLM announcing a surrender and releasing the cattle they had stolen from the Bundy family. What sets all this apart from massacres like Waco, Oklahoma City or 9/11? The fact that in all those cases, government had near-total control over the media coverage and therefore could construct the false narratives to be broadcast to the masses. All three of those events took place long before the rise of social media and the modern-day phenomenon of rapid sharing of videos, photos and articles. 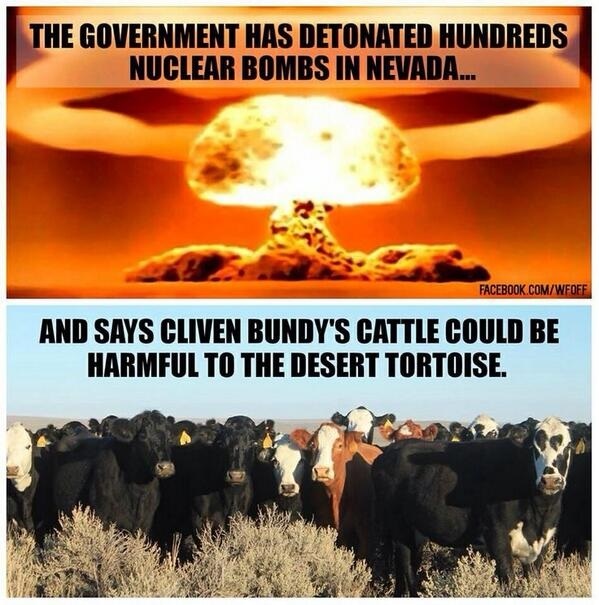 This story at the Bundy Ranch in Nevada, in other words, got away from the feds before they could control the narrative. Oh, they tried of course. There are reports that cell towers were shut down to prevent citizen journalists from completing phone calls and sending photos. The feds also shut down the air space around the ranch, commanding the FAA to issue an air traffic "blackout" to prevent citizen journalists from using airplanes and helicopters to monitor the situation. They were too late, however. A pilot had already done a flyover and exposed the BLM's bovine concentration camps, which the agency had desperately tried to hide from the public. Citizen journalists also snagged the video of BLM personnel ordering attack dogs to attack innocent bystanders. In this video, I provided absolute video proof that the BLM was the aggressor, yet the mainstream media stupidly reported this as protesters "attacking a police dog and assaulting law enforcement officers." The bottom line is that the mainstream media thinks you are incredibly stupid and will buy anything they say, no matter how illogical or irrational it might be. What the alternative media has now proven is that the mainstream media is largely irrelevant. It matters nothing what they print or broadcast. The people who are informed know it's all lies, and the mind-numbed propaganda victims who still watch shows like CNN and MSNBC are irrelevant to the march of history anyway. Real history is being shaped, investigated and reported by the alternative media. We are the ones who have no big corporate sponsors and no million-dollar budgets, but we have the hearts and minds and passion for truth and justice that drives our work to levels of authenticity that the mainstream media can never hope to attain... regardless of production budgets. 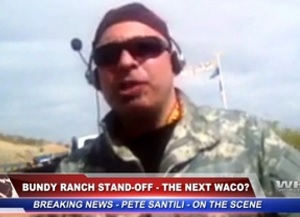 In fact, for his on-the-scene reporting and active involvement in standing up to the feds, guys like Pete Santilli deserve to be nominated for journalism awards. I don't agree with every single thing he posts, but his reporting work on the Bundy Ranch was astounding. Click here to visit his Facebook page. The research uncovered by Kit Daniels at Infowars is also world-class journalism. Kit deserves to be nominated for some sort of journalism award for that article, and follow-up articles by Paul Joseph Watson were also outstanding. This is the kind of work the Washington Post used to do a generation ago when it was an institution of journalism instead of a shameless political mouthpiece for the White House, but today Washington Post reporters know they will never be allowed to cover the stories that really matter because such stories are declared off limits by the powers that be. For once-grand institutions of news reporting like the New York Times and the Washington Post, the era of honest journalism conducted in the public interest is a long-faded shadow. Today, mainstream media exists solely to catapult corporate propaganda and fill the minds of the American people with useless drivel as a distraction from the real history bring shaped around them. In fact, internet-savvy viewers and readers of today automatically distrust any news reporter who is obviously reading a teleprompter. If there's a teleprompter involved, it's obviously scripted news. And if it's scripted news, it's probably pure bunk. Real journalism isn't scripted. Today's viewers would rather see an honest person with a rag-tag wardrobe reporting the news on the side of the road than from a person with a million-dollar smile and a thousand-dollar suit reporting from a flash-and-dazzle studio by reading a teleprompter. Everybody knows the teleprompter news is fake. Everybody knows the "news barbie" who was hired for her good looks has no real clue what she's even reading or saying. Everybody knows the mainstream media is far more interested in BLOCKING important stories than reporting them. And if mainstream news organizations don't change, they will continue to plummet in viewership and revenues. Already, MSNBC -- owned in part by Microsoft -- is a pathetic shadow of a failed news organization. CNN discredits itself by the hour while Fox News consistently steals its market share and gains ground with viewers. The NYT is incessantly on the verge of bankruptcy, it seems, and the Washington Post only survives because it was bought by Amazon.com founder Jeff Bezos, a true genius of a business man without whom the organization was utterly doomed. Everywhere you turn in mainstream media, the suits are desperately trying to look and act like independent media, but they can never quite pull it off. MSNBC's hopelessly disastrous rollout of Ronan Farrow is a case in point: the guy can't seem to place a string of words into a coherent sequence even when he does have a teleprompter! Throw this guy in the middle of the Nevada desert on the Bundy Ranch story, and he would probably wet himself on camera. Especially if he saw somebody wearing camo. Meanwhile, veterans of alternative media like Pete Santilli, David Knight (from InfoWars) and even myself never use teleprompters and we can carry hours-long broadcasts without missing a beat, regardless of the difficulty of the situation. Why? Because we've got brains and passion for real news. On top of that, we do what we do out of sheer passion alone, without any million-dollar contracts, corporate sponsors or publicity agents. We report the truth for the only reason under which journalism should ever be practiced in the first place: because the People have the right to know what's happening in the world around them. And it's the alternative media that now appears to have the exclusive credibility to bring it to them.